The measure principle is based on a tank located in the lower part of the stem, filled with gas (normally Nitrogen) at a certain pressure, associated to a Bourdon tube and a manometric mechanism. The variations of the temperature expands or contracts the gas, causing the movement of the Bourdon tube and therefore the indicator needle. 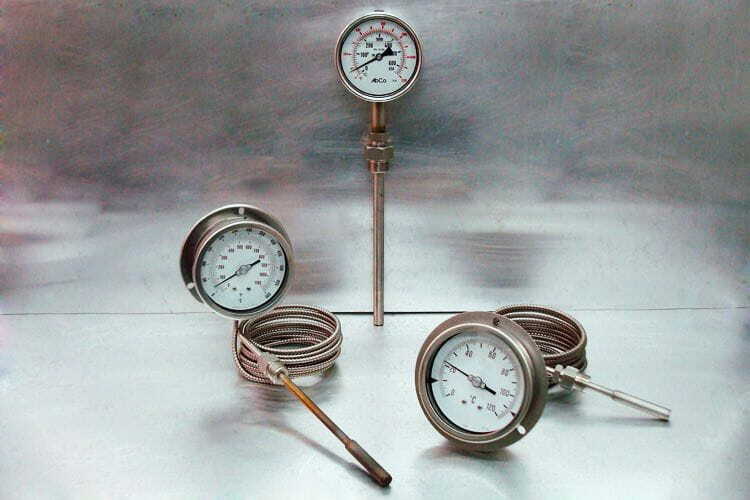 Gas-actuated industrial dial thermometers, fully stainless steel, rugged construction. Available in Ø 100 and 150 mm. Available for local or remote mounting, by means of a flexible capillary tube. Suitable for heavy duty installations with vibrations (with glycerine filling).